High mountains and deep gorges. The Free State of Bavaria and the “holy land” of Tyrol. This cycling tour holiday brings you the very best that Europe has to offer. Designed specifically for you to enjoy via a series of cycling routes, you can experience the wonderful mountain scenery, fortified castles, and impressive monasteries on your way from Innsbruck to Munich. The beautiful Zillertal valley, the crystal clear waters of the lakes and the young, turquoise blue river Isar will enchant you. In its narrow riverbed, the river Inn flows through the most mountainous state in Austria. Take a rest in one of the many quaint restaurants and get to know the world-renowned hospitality. Imposing mountains, fresh air, crystal clear water quality, and a rich cultural heritage – that’s what Bavaria and Tyrol have in store for you on this tour! You mainly cycle on cycle paths along the Inn and Isar valleys and also on some slightly hillier sections on natural paths. There are longer hills on day 3. You will cycle on beautiful bike routes and minor roads. Some main roads have to be used for very short distances. For a similar bike tour in Austria, check out our Innsbruck to Salzburg by bike holiday. Routes may be subject to change or alteration. All route notes, maps and day-by-day information are given to you upon arrival at the first hotel or the welcome meeting. GPS/GPX files are available for most of the cycling holidays to Munich we offer. Please ask us for details. There are now Eurobike signs today! Ausflug ins Zillertal 60 km You only follow the signs „Innradweg“! Hilly route without steep inclines. Ausflug Tegernsee 45 km Slightly hilly terrain, several smaller ascents to tackle. 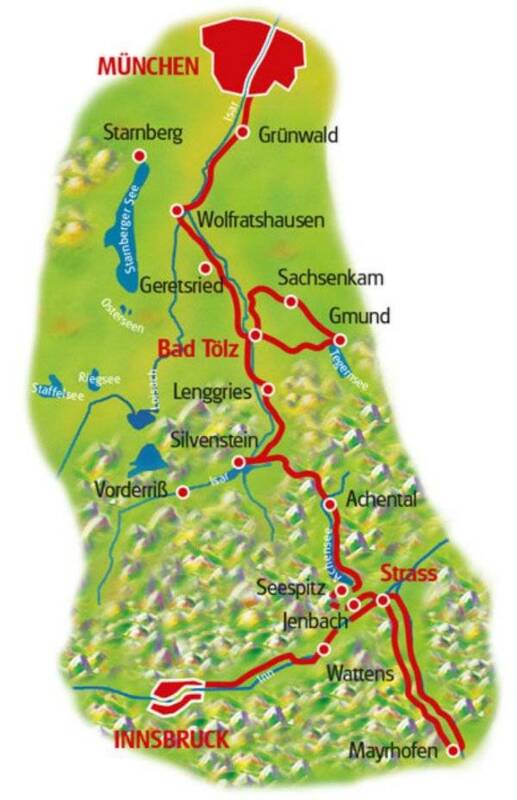 Bad Tölz – München 65 km Hilly route with a greater increase of about 1 km. We recommend flying to Innsbruck (Austria) or Munich (Germany) airport to reach the starting point of this Innsbruck to Munich by bike holiday. Austria Trend Hotel Congress: taxi takes about 10 minutes and costs about €16. Alternatively, it`s about a 1km walk or you can catch bus line “H” and get out of the bus at “Haus der Begegnung” which will cost about € 2.50. Hotel Central and Zach: taxi takes about 5 minutes and costs approx. €9. Alternatively, it’s about a 250m walk. You do not need to go back to the starting point of this Munich cycling tour as all hire bikes are left at the final hotel. Important: Please book your flights only after the Innsbruck to Munich cycling tour has been confirmed by invoice or email. Flights and transfers are not included in the advertised holiday price. The Innsbruck to Munich by bike holiday includes the daily transfer of luggage to the next hotel and local support if required.